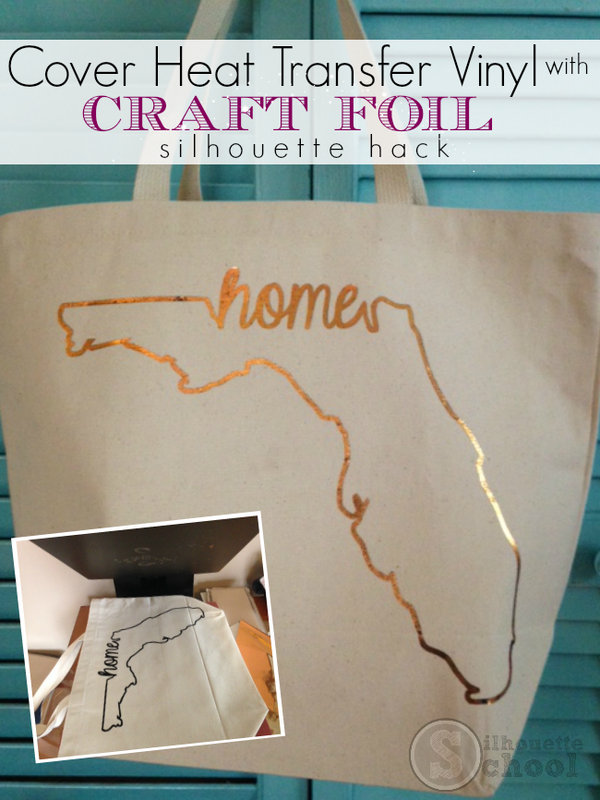 Silhouette Hack: Craft Foil over HTV for an Amazing Effect! I just blew my own mind with this little Silhouette hack!! I have figured out a way to add metallic craft foil to fabrics and apparel and the results are amazing! The secret is not ink and heat (as is normally the case with reactive foils), but heat transfer vinyl and heat. Yes, just plain ol' smooth HTV!! What you want to do is cut the design you want to be foiled on HTV first. Just pick any color heat transfer vinyl. I used black because I had a lot of it. I think black or white are probably your best best in case some tiny areas don't pick up the foil. As you can see in this test project I did during my 'research', the pink HTV is slightly showing through in some areas. So cut the black or white HTV like you normally would and apply it to your surface just like normal - heat around 305 for 20 seconds. In this case, I was making a tote bag. Need an HTV refresher? Here's the Heat Transfer Vinyl for beginners tutorial. After your heat transfer vinyl is in place, remove it from the heat source while you crank up the heat on your press or iron. (I would only suggest doing this with an iron if you have a small design that can fully fit under the iron.) I turned my heat press up to 385. Anything hotter than that seemed to make the HTV bubble and start peeling away from the fabric. Once your heat press (or iron if you're working on a small design) is super hot, lay a piece of metallic craft foil over the entire htv design. Cover the foil with your teflon sheet and apply heat and pressure for another 15-20 seconds. Remove the shirt or bag from the heat press and let it cool completely before you remove the foil. Don't get hasty and peel off the foil while it's still warm. You will see that as the foil cools it really starts to stick to the htv - but not the areas where there is no heat transfer vinyl. Can you see in the picture below how the foil is kind of suctioning or grabbing the HTV areas? Once it's cool, carefully begin to peel away the foil. The foil area that was covering the HTV will be left behind and the results are stunning!! I do really like this little Silhouette hack. Actually, I was surfing through the Internet looking where to find essays written for you and stumbled across this post. Such a great metallic craft foil here and results are just amazing. Thanks for sharing. Hi - Love this hack! Thank you! I've never worked with craft foil before, can you re-use the area of the foil that did not meld with the HTV? Yes, save your foils. Google Synergy 17, he has tons of videos on using foil & the foil he sells is gorgeous! AMAZING! Have you tried this on a shirt? Does it wash well or will the foil peel off? I'd like to know that too. I'd love to try that on a shirt. can you wash items with the deco foil? I, too, am curious about washing foil! This is an amazing hack, I love the look of the foil! Beats buying textack if it is washable! Is this more economical than just using foil HTV?? Foiled HTV is much thicker, it doesn't look as smooth as this application. I have purchased foiled HTV from a few places & it's very thick & bulky (IMO)! However, someone above mentioned using texttac (a double sided adhesive) with foil, it looks great too. Synergy 17 has wonderful foils in prints & solids, also great video tutorials. (No affiliation, just love this company & all things foiled)! Well this didn't work for me. I tried it with white vinyl just like the tutorial said and the foil wouldn't stick. Wasted 4 sheets of foil trying. I must have done something wrong.